Welcome to the Pennsylvania Key website! On this site you will find access to all the resources you need to participate in OCDEL programs, advance your career in early education, and improve your quality as a provider and a professional! Families – Please visit our family websites for information on helping your child grow and choosing quality child care and other early learning programs! The Pennsylvania Key (PA Key) is a partner of the Pennsylvania Office of Child Development and Early Learning to provide families access to high quality services to prepare children for school and life success. Services include professional development system supports, technical assistance for OCDEL grantees such as Pennsylvania Pre-K Counts, program quality assessment, communications, and fiscal supports. The Pennsylvania Office of Child Development and Early Learning (OCDEL) administers home visiting, child care, child care assistance, early intervention and pre-kindergarten programs funded through the Pennsylvania Departments of Education and Human Services. 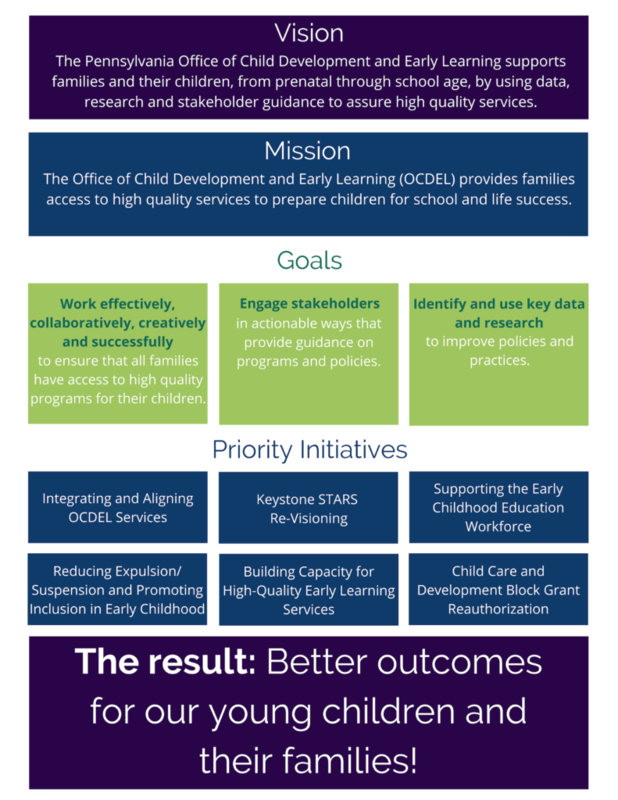 In its efforts to increase access to high-quality early learning services, OCDEL sets quality programs standards, comprehensive accountability, and family engagement to help children and families reach their full potential. Visit the Early Learning Programs page for more details on OCDEL programs.